Chris Erickson (Vic) has secured automatic nomination for selection to the Australian Olympic Team after winning the national 50km race walk title in Melbourne (Vic) yesterday. The second to cross the line behind Evan Dunfee (CAN, 3:43:45), Erickson’s time of 3:54:10together with his top-16 finish at the IAAF World Championships earlier this year ensures that he is now eligible for selection by the Australian Olympic Committee. “I’m really happy to know that I’ve punched my ticket for Rio,” Erickson said. Dunfee’s result to win the race was a Canadian record, while Marc Mundel (RSA), who crossed third in 3:54:12, set a new African record to round out the top-three placegetters. The Australian championship silver medallist was Brendon Reading (ACT, 3:55:03, PB), while Ian Rayson (NSW, 3:55:17, PB) won bronze. For many, the stunning personal best results followed a period of training at the Australian Institute of Sport that saw athletes involved in a nutrition study led by Dr. Louise Burke. The study is aiming to unlock the secrets of how specific diets can provide a clean edge at the Rio 2016 Olympic Games, and will resume in January. “I’ve enjoyed some really good training coming into this and I love competing here in Melbourne. 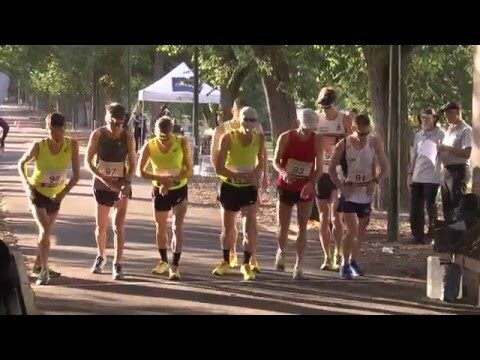 This is a very fast course,” Dunfee said. Four women secured Olympic Games qualifying performances for the women’s 20km walk. Regan Lamble (Vic) was the first to cross in 1:30:45, with Stephanie Stigwood (Tas, second, 1:32:22), Rachel Tallent (Vic, fourth, 1:34:16) and Tanya Holliday (SA, fifth, 1:34:56) hot on her heels. IAAF World Youth Championships representative Tyler Jones (NSW) clocked 42:48 to achieve a qualifying performance for the IAAF World Junior Championships. The winner of the boy’s 10,000m race walk, Jones is joined on the qualifiers list by Kyle Swan (Vic, 43:01) and Adam Garganis (Vic, 43:03). In the girl’s 10,000m event, Zoe Hunt (ACT) crossed the line in 47:41 to achieve her first qualifier for the IAAF World Junior Championships next year. To view and download results from the Australian 50km Road Walking Championships, please click here.